This might sound like it's straight out of The Onion, but I assure you that it's true: An Australian woman really did receive over $140,000 Australian dollars because her dog ran her over in a freak accident. The victim in the accident hasn't been named, but ABC Australia reports that the incident happened in 2005, after the woman loaded three of her dogs into the car and one of them decided to use the car as a getaway vehicle. She loaded two of the pets into the back seat of her car and one into the front passenger seat, and that's when her troubles began. 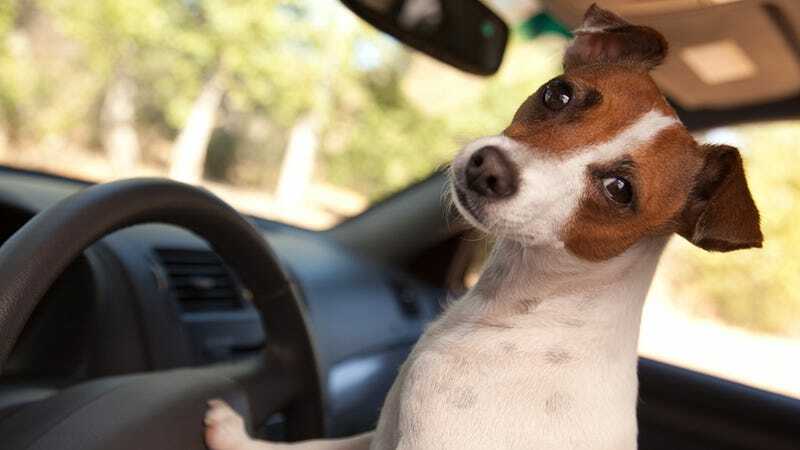 The engine was running to power the air conditioner, and as the woman went to get into the driver's seat, one of the dogs bumped the handbrake. The woman, who was in her 60s at the time, was caught in the door and dragged along with the car before falling to the ground and being run over by the vehicle. See, this is why I always make sure the car is off when the rabbit and the guinea pigs and I get inside (not that we ever really go anywhere except the pet store. I don't want you to think I am taking my pets out for rides), because I know all three of my furry little friends are evil and would off me the first chance they got. Also because I sometimes knock things over and once almost caused an accident because I was flailing my limbs about with abandon and now my partner is very careful about how I enter and exit the car. The victim in this particular accident suffered numerous injuries, and while her lawyer agrees that the situation is comical in some respects (and I sincerely hope this woman has been able to dine out on this accident at least a little), she also stresses how painful it was for the woman, who had to have, among other things, both shoulders replaced. Injuries couldn't be awarded by Victoria's Transport Accident Commission until the woman's injuries had been properly assessed and treated, but now, ten years later, she's doing much better and is being paid the $144,000 as well as having her medical expenses taken care of. And not that this makes it any better, but the money is only part of the settlement which will also cover the victim's lost wages. It's excellent that Australia has this kind of policy, but I couldn't see it happening in America. First people start getting awarded damages in no-fault accidents and the next thing you know, everyone on your block is getting run over by their dog, cat or malicious parakeet.